Tuesday night: Mostly cloudy. Lows in the upper 20s. Wednesday: Snow developing late. Highs in the mid 30s. Thursday: Snow ends. Late clearing. Highs near 40. A powerful storm packing heavy, wet snow and strong winds could dump up to 10 inches of snow in some areas, the fourth nor'easter to wallop the region in three weeks. 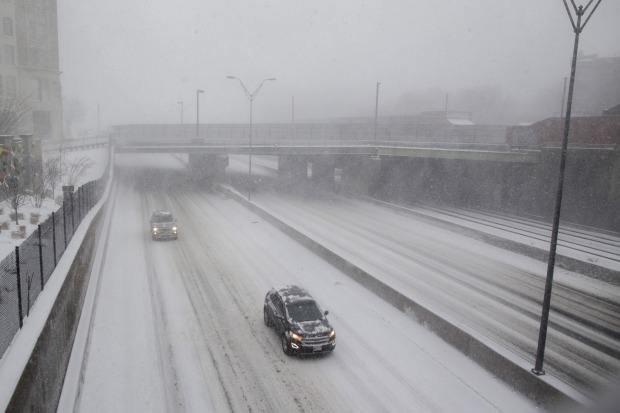 The National Weather Service has issued winter storm watches and warning from 8 a.m. Wednesday to 8 a.m. Thursday for most of Massachusetts and southern New England. After a chilly, dry Tuesday with highs near 40 degrees and a wind chill in the 30s, temperatures will drop overnight to the 20s and teens. 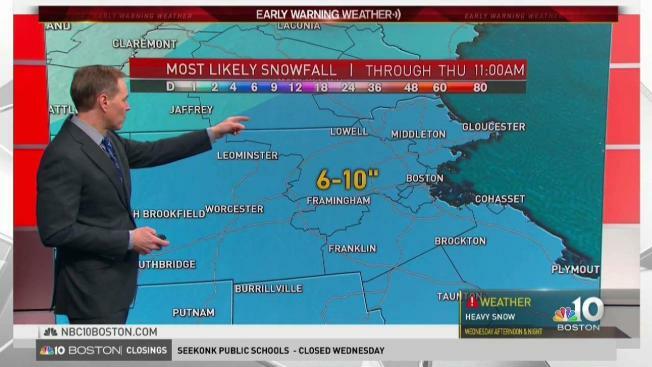 Snow is forecast to begin falling between 7 a.m. and 9 a.m Wednesday in Worcester, arrive in Boston between 9 a.m. and 11 a.m. and reach Merrimack Valley around 11 a.m. to 1 p.m. The storm could arrive earlier or later than predicted as the storm's track shifts. Wednesday's nor'easter is not expected to strike New England with the same intensity of its three predecessors, but may still cause power outages due to its high winds. Wind gusts of over 50 mph are expected on Cape Cod and the eastern Massachusetts coast could see winds of more than 40 mph. High wind watches are in effect for parts of southeast New England, including areas near the entire Massachusetts shore, Cape Cod, Nantucket, and Martha's Vineyard, as well as southern Rhode Island, the NWS reported. Coastal flood watches have been issued for southeast Massachusetts, including Cape Cod, Nantucket Island and Martha's Vineyard. The Massachusetts Emergency Management Agency cautioned residents south of Boston that "minor coastal flooding" is possible during high tide Wednesday afternoon, with more flooding possible between 1 a.m. and 6 a.m during Thursday morning's high tide. Snow flurries and some strong winds may linger in parts of Maine and eastern New England through Thursday morning and midday. The weekend looks cool, with clouds far outnumbering sun and a few periods of snow showers overnight Friday. The region could be grazed by another storm Sunday evening.